Boccia may just be the oldest ball sport played at the Paralympics. Games of bowls, where players try to land balls as close as possible to a jack, or target ball, have been around since ancient times and remain popular throughout the world. 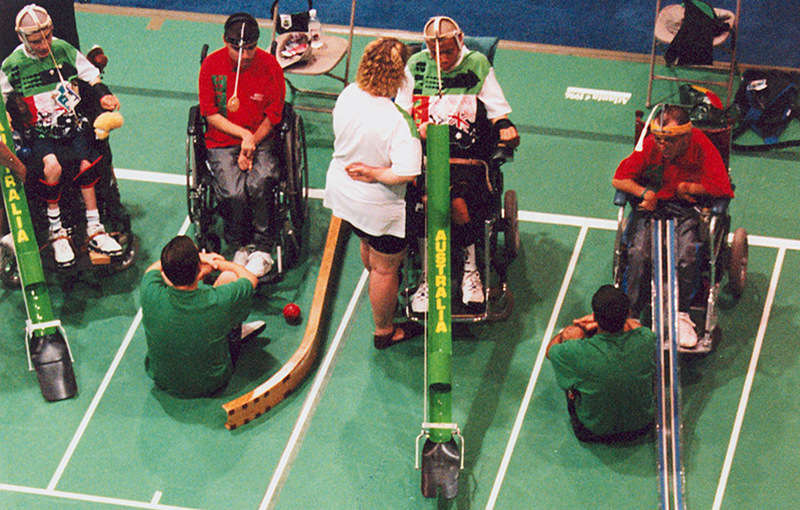 Boccia’s points of difference are that it is played exclusively by athletes in wheelchairs, indoors on a smooth surface, and using stitched leather balls. Boccia is played by athletes with the highest levels of impairment of any Paralympic sport. Originally for athletes with cerebral palsy, Boccia now includes athletes with other disabilities which affect motor skills. Players are classified into throwing/kicking classes and a ramp class for athletes who are unable to throw or kick the ball. These players use a ramp assistant, who sits in front of the player with their back to the play and positions the ramp and ball according to the players’ instructions. The player releases the ball, which rolls down the ramp onto the playing surface. Top players are incredibly skilful, and it is not unusual to see balls literally mounded up around the jack. At the highest level, the sport is very competitive. At London in 2012, the 21 medals available were shared by 10 countries. Brazil topped the table in 2012 and 2008, ahead of traditional powerhouses Portugal, South Korea, Spain and Great Britain. The Paralympic Boccia program is managed by the Australian Paralympic Committee, which partners with Boccia Australia to grow the sport at all levels. Due to the high levels of support required by players, significant investment is required to train and compete. Just 14 athletes have represented Australia in Boccia at the Paralympics since the sport was introduced in 1984. The 1996 Games produced Australia’s best ever results – Tu Huyhn and Kris Bignall won a bronze medal in the pairs, and Australian athletes placed fifth in the team event and achieved fourth and fifth place individual finishes. It was the only time Australians have reached the medal rounds.